So I’ve thought for quite some time now that my microwave was little more than a device to reheat leftovers, to thaw items from the freezer and to make popcorn. I’ve felt this way for many, many years. I’ve tried cooking in it and haven’t liked how certain foods have turned out (largely due to texture-based issues such as chicken seeming rubbery, etc.). However, a friend of mine has recently clued me into the fact that my microwave can be used for so much more and has likely been one of the lesser-used tools in my kitchen arsenal, going largely neglected for years. I was complaining that whenever I cook rice to the instructions either on the stove-top or in my rice-cooker, I always end up with crispy, overcooked rice layering the bottom of my rice dish. It doesn’t seem to matter how much water or butter I add, nor does it seem to matter how long I cook the rice for or at what temperature. I mentioned I was almost ready to give up on rice altogether which would be such a loss, since it’s such a versatile food. She asked me if I had a Corningware dish. I do. In fact, I believe it’s called a French White 2.5 Round Covered Dish (with a clear glass lid). So she suggested I try cooking my rice in the microwave in the Corningware dish. I was stunned. I had no idea I could do that. I know, I know… some of you likely already knew that. So I looked around online for how to microwave Basmati rice in the microwave. I came across this recipe on Epicurious and halved the recipe and it turned out beautifully! It’s important to cook it until those ‘vent’ holes pop up, though. I didn’t look for that the second time and followed the recipe to a “T” and continued to the cover and cook for five minutes part, and the rice didn’t cook up properly (being way too al dente). I would probably either cook it in two batches next time, or cook the rice longer before covering it and cooking for the additional five minutes. 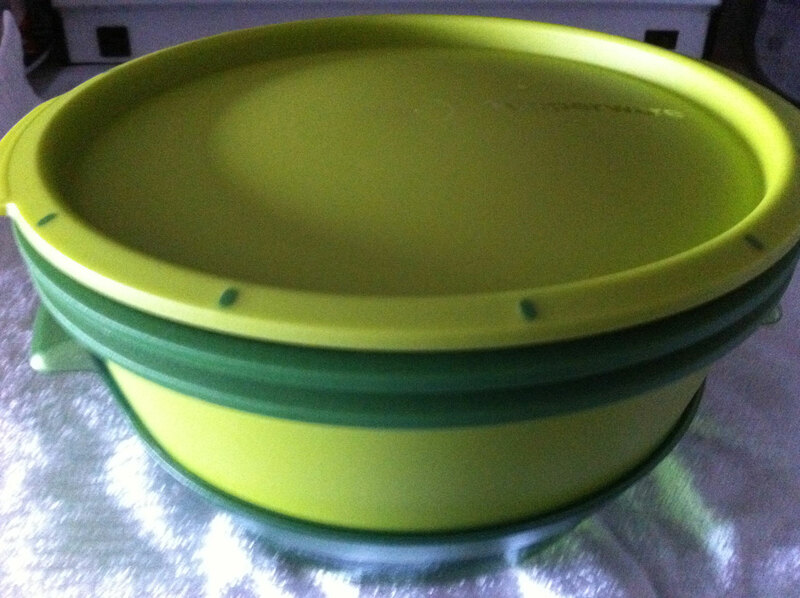 This same friend sells Tupperware at TWDiva.ca, and managed to talk me into buying the Tupperware SmartSteamer (pictured here). I wasn’t totally sure if I was going to use it much or if I was even going to like it, but I bought it and gave it a try. The first night I used it, I steamed mini red potatoes in the top tray and halved cobs of corn in the bottom. The potatoes needed 18 minutes. The corn needed nine minutes. So halfway through the 18 minutes, I swapped out the corn cobs with the other half of the corn cobs, wrapping the finished half-cobs in foil to keep them warm. It worked out perfectly. And can I just say that I will likely never cook corn on the cob for my hubby and I any other way again? The potatoes probably could have used 1-2 more additional minutes, but otherwise were pretty darned good, tossed with a vinaigrette dressing that Tupperware suggested in the accompanying booklet to the steamer. The corn was really nice, sweet and tender, while retaining its crunchiness. Last night, I steamed corn in the bottom again and asparagus spears in the top. I tossed the asparagus with some butter, salt & pepper last night after that and it was really darned tasty. Simple, but really great. I’ve boiled asparagus before but it turns out limp and almost tasteless, just bitter. This time, it was cooked but still crunchy and no flavour was lost. Each batch only took about five minutes, so after two batches, the corn in the bottom was done. Easy! Who knew that my microwave could be my best friend when it came to cooking certain foods; not just for quickness but also ease and lack of mess? Normally, corn on the cob would have taken my absolute largest pot in the entire kitchen to cook and at least 30 minutes (to get the water to boil, then to cook the corn). And the asparagus would have been in another pot altogether. I cooked both in the same dish and in a fraction of the time! This entry was posted in dinner, kitchen implements and tagged asparagus, corn on the cob, microwave, potatoes, steaming. Bookmark the permalink.